Based on personal knowledge and intimate interviews with his subject, as well as access to W.J. 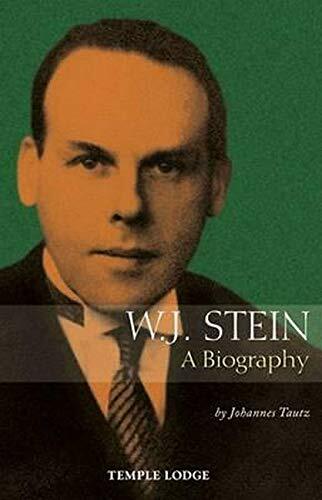 Stein's archive of letters and documents, Tautz's biography is a thoroughly-researched and lovingly-detailed study of an exceptional life. Walter Johannes Stein (1891-1957) was one of the original pioneers of anthroposophy. A student of the Austrian philosopher Rudolf Steiner, Stein met his spiritual teacher whilst studying at Vienna University. After serving in the First World War, Stein was invited by Rudolf Steiner to teach History and Literature at the fledgling Waldorf school in Stuttgart, despite the fact that Stein's doctorate was in Philosophy and his training in Mathematics and Physics. Through his efforts to master the new disciplines, and with the aid of unconventional methods of research, Stein developed groundbreaking new insights into the story of Parzival and the mystery of the Holy Grail, which led to his seminal book The Ninth Century and the Holy Grail. Tautz describes Stein's close friendship with Eugen Kolisko, his struggles to help establish the threefold social order, his work as a Goetheanum lecturer, and his eventual estrangement from the Anthroposophical Society following Rudolf Steiner's death. After journeys of discovery across Europe, Stein landed in London in 1933 - a refugee from the Nazi aggression in Central Europe - where he met his mentor D.N. Dunlop. Dunlop employed him to help establish the first World Power Conference. Based in England for the last 24 years of his life, Stein became a prolific and popular lecturer and the editor of the important anthroposophical journal The Present Age. Long out-of-print, the new edition of this important work is a welcome addition to the growing number of biographies on the founders of anthroposophy. JOHANNES TAUTZ - author, historian, religious scholar, anthroposophist and Waldorf teacher (at the first Steiner school in Stuttgart, Germany) - was born in 1914 in Koblenz. He studied German and History, graduating with a dissertation on Schelling. The author of Attack of the Enemy, The Occult Inspiration Behind Adolf Hitler and the Nazis, he lived in Darmstadt, Germany, until his death on 13 March 2008.